School safety is now a common consideration for educational facilities throughout the US. Procedures are often in place to address potential threats and situations, and proactive precautions are taken. One Massachusetts school district employed tactics including locking facility doors and installing security cameras, but a weak point of entry remained – the glass windows and door insets. 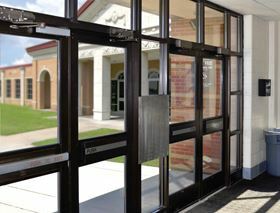 To address this vulnerability at the school administrative office’s entryway, the school district sought to replace the existing one inch insulated glazing units with tempered inner glass insets in the doors and sidelights. Several alternative solutions – including limited glass and safety window films to ‘harden’ the district entryway – did not offer the level of protection the district wanted. A specially designed composite laminate featuring Bayer MaterialScience’s Makrolon polycarbonate sheet was the district’s chosen solution. It is a laminated product consisting of outer layers of glass with a custom security-strengthened substrate core. The strengthened core features Makrolon polycarbonate sheet’s improved durability, strength and impact resistance. School safety is now a common consideration for educational facilities. This story is reprinted from material from Bayer MaterialScience, with editorial changes made by Materials Today. The views expressed in this article do not necessarily represent those of Elsevier.